These interactions are common for Dan. 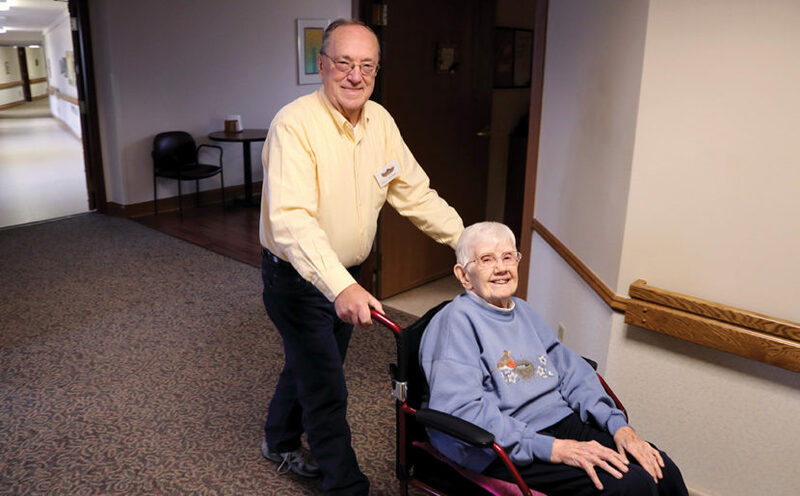 He’s been volunteering—walking sisters to physical therapy—at Mount Carmel for more than eight years, and it’s something he looks forward to. He loves it. A Dubuque native, Dan grew up being educated by sisters at Nativity Grade School. His mother taught several BVM sisters when they were in school. So for Dan, volunteering just made sense. When not volunteering, he also works with Leonard Funeral Home in Dubuque and has assisted with the funerals of many of the same sisters he’s come to love. 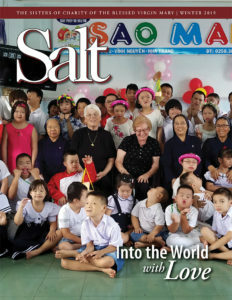 Despite those struggles, Dan plans to continue to give the sisters at Mount Carmel laughter, support, and a steady hand down the hallways “as long as I can” with some ‘Danomite’ smiles. Featured image: For eight years, volunteer Dan Brune has been bringing smiles to BVMs like Paulina Sullivan. next post: Caring Enough to Care for Ourselves!